Technology shapes every facet of Canadian life. But will it hurt or help us? Too often, technological advancement is either demonized as a job-stealing, privacy-violating terror; or beatified as a panacea come to rescue us from our worst selves. But there’s a middle ground—a way forward that shapes technology to benefit us, building the kind of society we want atop it. In the immediate future, tech can streamline the way countries govern today, improving antiquated processes and updating how citizens and the government interact at every level. In the long term, it lets us reimagine what’s possible for nations, anticipating pitfalls while putting the best innovations to work. But we must not sit idly by and let the future happen to us; we can shape it. And that’s why we launched this conference. The iPhone is just a decade old. In that time, digital connectedness has burned through our lives like wildfire, searing small screens into our everyday. Every corner has a sensor; every click leaves a trail of digital breadcrumbs. Speaking to a computer is now commonplace; fax machines are antiquated punchlines. FWD50 explores this transition, marrying policymaking, technology, ethics, and invention. It’s a three-day conversation on digital transformation held in Canada’s capital city, bringing together citizens, the public service, elected officials, technologists, and innovative thinkers from around the world. Want to dig in a bit deeper? Check out our manifesto on digital government, or read our latest posts on Medium where we explore the challenges and opportunities of tech and society. We’re an all-Canadian team of event organizers and technologists behind some of the world’s most influential technology events. 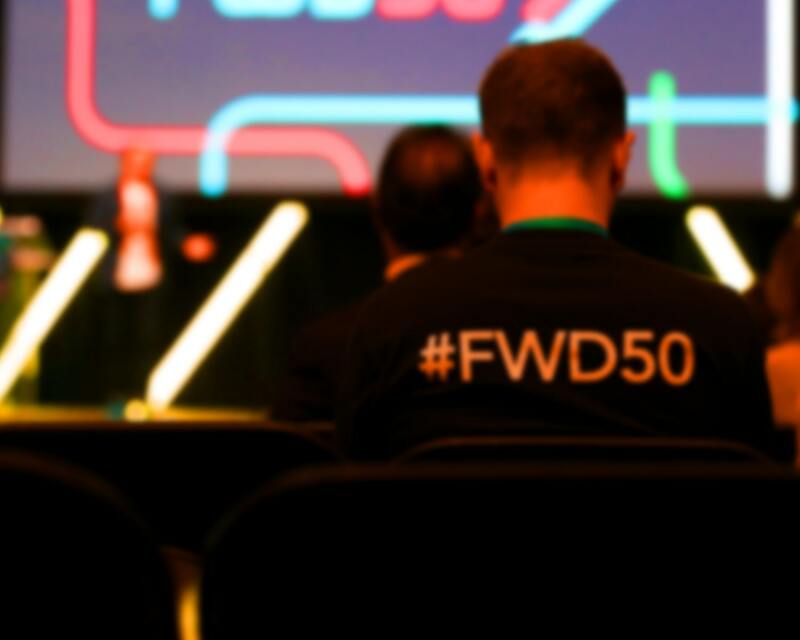 For us, FWD50 is a labor of love—a chance to put the most important conversations of a generation front and centre, and to bring the incredible power of technology to bear on society’s thorniest problems. We got a ton of feedback and input before and after our inaugural 2017 event. Much of it had a direct impact on the structure of the conference, and we continue to learn from you. We want this to be a collaborative experience; we can’t talk about making society better for all without including everyone. We take content really seriously. We’re flexible about most other things. And we want to create memorable experiences that give audiences permission to think out loud, outside their usual constraints, because that’s how change will happen. We’re lucky to have the support and counsel of a diverse, global advisory board with deep backgrounds in digital government, technology, and inclusion. Pia (Waugh) Andrews is the Service Integration Lead of the Department of Internal Affairs in New Zealand. James Delorme is president of FirstSky Media Group, a technologist and former chief of Klahoose First Nation. Natalie Evans Harris is COO of Brighthive, and was a Senior Policy Advisor to the US CTO in the Obama Administration. Kelly Hutchinson is Vice President of Public Affairs and Information Technology at Edelman. Mike Kujawski is managing partner at the Center for Excellence in Public Sector Marketing. Andre Leduc is the Vice President Government Relations and Policy at the Information Technology Association of Canada. Olivia Neal is the executive director of digital change in the CIO branch of the Canadian Federal Government. Maria Pagliarello is a Visiting Executive at the Association of Professional Executives of the Public Service of Canada, with a long background in the Canadian public service. Aaron Snow is the CEO of the Canadian Digital Service, and a board member of the OpenGov Foundation. Siim Sikkut is the CIO of the government of Estonia. Maayan Ziv is the founder of AccessNow, and has been an advisor to the Privvy Council and Parks Canada.